Mesothelioma lawyers representing the victims of asbestos exposure and their families practice in a very specialized area of the law. Mesothelioma law is a narrow practice area focusing exclusively on asbestos related lung cancer, often a result of occupational exposure or military service. Choosing a mesothelioma lawyer is a critical decision best made with the most relevant information possible. There are approximately 2500 new cases of mesothelioma diagnosed each year in the United States. The laws and parameters regarding winning a lawsuit are complicated and vary from state to state. 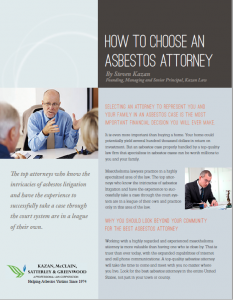 Attorneys who focus exclusively on asbestos law know the intricacies of asbestos litigation and have the experience to successfully take a case through the court system are a special breed. The mesothelioma attorneys at Kazan Law have the focus, experience and knowledge to handle your case and secure the justice and compensation you deserve. Kazan Law has been representing victims of asbestos exposure since 1974. Our mesothelioma attorneys have been instrumental in shaping the law to ensure that present and future victims of mesothelioma will have the opportunity to seek justice in the court system. Our attorneys have also played a crucial role in the development of trust funds to pay claims for bankrupt asbestos companies. At Kazan Law we work on a contingency basis, which means fees are taken only after the completion of trial or settlement. We don’t ask for fees up front. Our attorneys are prepared to handle the complex matters involved in your mesothelioma case. It is often possible to pursue action against a number of defendants, including manufacturers and distributors of asbestos-containing materials. Kazan Law’s mesothelioma lawyers will be able to assess your circumstances and determine the best strategy for gaining compensation and justice. Over the last 44 years, Kazan Law mesothelioma lawyers have won many landmark cases and achieved many large settlements from asbestos manufacturers, distributors, contractors, premises owners, and the insurance companies who represent them. Has a doctor diagnosed mesothelioma or asbestos lung cancer?